A 6 week video-based training program that will provide you with the “secret sauce” for attracting new clients whenever you want! You get a new JD video episode via a link to your inbox every week. We know your problem – not enough clients! 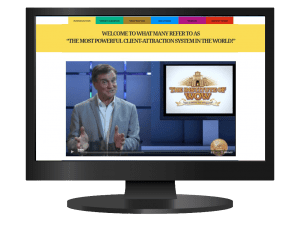 Well imagine having a “6 week solution package” – where each component of JD’s Wheel Of Wow Client attraction Program is delivered to you on video every Monday morning. In just 6 weeks, you’re going to learn what is arguably the most powerful “client attraction formula” on the planet. JD’s Phenomena Program is a priceless marketing system that can work for any business, whether online or offline. And when you complete the 6 week training series, you’re invited to put together a 90 day Marketing Plan for your business – and guess what? JD will personally provide you with an audio critique when you send him your 90 day plan! One word to describe this “personalised service” from a genius – WOW! Can you begin to imagine what such a critique would be worth? This guy is one of the best “marketing minds” in the world – AND HE’S GOING TO PERSONALLY CRITIQUE YOUR MARKETING PLAN! YOU’RE THINKING OF STARTING A NEW BUSINESS. YOU’RE A HOME-BASED BUSINESS AND YOU WANT TO GROW. YOU’RE A COACH OR A CONSULTANT. YOU’RE AN ESTABLISHED SMALL TO MEDIUM SIZE BUSINESS AND YOU HAVE LITTLE OR NO MARKETING RESOURCES. 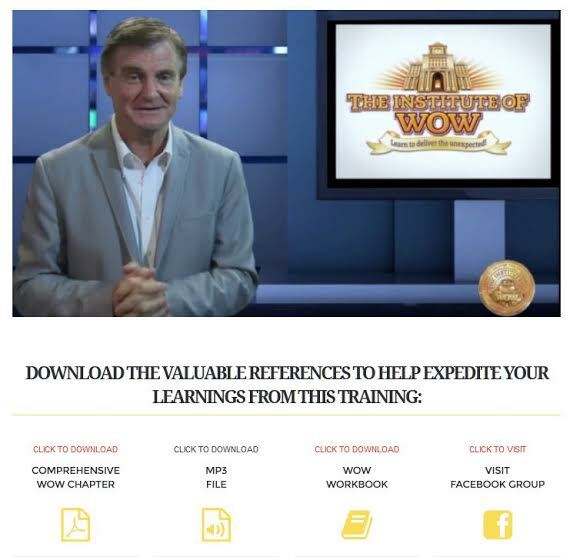 Over the 6 weeks, JD provides you with video training that takes you through the 5 modules of his proprietary marketing system called The Wheel Of Wow. In each of the 60 minute video episodes, JD provides an easy-to-follow explanation of how to create a marketing plan that attracts profitable customers who are willing to pay more and come back more often. We all know that if you actually “do exercises”, any learnings become more powerful – hence with every week’s 60 minute video-training, you also get a Wow Workbook that has tasks for you to complete (ones that will assist you to build a knockout marketing plan for your products or services). You get JD’s entire priceless dossier on this unique “Phenomena” client attraction system – a new chapter delivered to you each week via digital downloads! No stuffy “academic-lingo” – just practical & innovative ways to lure new clients to buy your products or services. In other words. JD knows that you want to have a formula “for turning on the customer tap” whenever you want to! His Wheel Of Wow formula is a “plug & play” client attraction system that can work for ANY business. So if you want to stop racing from one promotion to the next, creating a dust-storm of activity when your bank balance is low and you’re desperate for new clients – this is the most insanely valuable investment you could ever make! 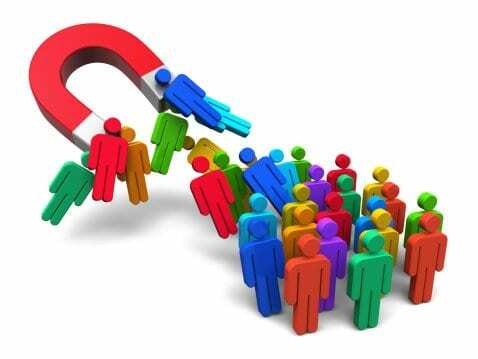 Imagine being able to attract new clients whenever you feel like it! Here’s what you’re going to learn over the 6 week video-based interactive training program. Together with each Monday’s video, you’ll also receive a “Wow Workbook” that mirrors the tips and teachings of JD’s video episodes. In other words, you can grab proven ideas & use them to attract new clients! The Wow Workbook will also have some “mini-tasks” for you to complete (if you wish) so that the learnings from this marketing genius become a brain tattoo for you! Let’s face it, we all know that if you complete a short task when being tutored, the information becomes so much more powerful and valuable, because you are actually doing something with it! Don’t worry, the homework is not overwhelming, far from it. Workbook, so his teachings have a better chance of “sinking in” and delivering you extraordinary value. INSTANT SAMPLE PAGES! GET RIGHT NOW! Click here to download a selection of “sample pages” of the Phenomena Chapters. You get a “new” chapter each week – with ideas & case studies you can swipe & use! These “chapters” are additional content on top of the videos – amazing teachings & insane value. Each week, together with your video, you get a PDF of the relevant Phenomena Chapter, a “Wow Workbook” & an MP3. LOOK WHAT YOU ARE GOING TO LEARN! JD will take you through his proprietary “customer magnet formula,” detailing each of the five components of this incredible money-making marketing machine. He will explain how you need to firstly determine your most profitable audience, so that you then build a marketing plan that targets these people and gets the best ROI. He’ll show you how to create an “artificial WOW” – ie. : McDonalds’ free toy in the Happy Meal product or the “freebie” in the Kellogg’s Cereal packs. He’ll show you how to fix your website and turn it from a lame information centre into a 24/7 sales juggernaut. He’ll show you how to build “repetitive trade” through Customer Loyalty Programs and other techniques. How to do a qualitative and quantitative research yourself without having to pay research companies. How to use online survey templates from the likes of Survey Monkey. How to actually “talk” to your “most profitable targets” & how best to get them interested in your products or services (It’s all about communicating to them appropriately!). You’ll get plenty of “case studies” from JD, so you know “HOW” to apply these techniques to your business. He shows you “HOW” other businessowners have exploded their sales by concentrating on “the RIGHT target audience!” Just take this advice & swipe the formula for your own business! How to charge more for your products or services and justify it. How to become “The UN” of your industry and stand out from the crowd (UNlike any of your competitors! ).How to enjoy your “expert status” and have more influence and authority. How to exploit “experiential marketing” – holding expos, dinners and cocktail parties (learn how to sell “once” to many!). How to use online communications to “turbocharge” the awareness of your wow factor! Why a “theme” can skyrocket your “wow offers” to new levels. A whole bunch of red-hot examples of JD’s clients using WOW factors. How to create an “avalanche response” to your marketing message by employing a problem/solution strategy. How to market your “solutions” rather than “suggestions” (people want solutions!). How to create powerful “video testimonials” to validate your solutions – and learn “where” to feature them on your website. How to use “reason why” advertising to increase your conversions (when selling your “special offer,” give them a “reason why!”). Countless examples of successful “problem/solutions” online and offline case studies – ideas you can instantly swipe & use! Week 5 – Be Different Online And Fix Your Website! If your “bounce-rate” is high, here’s how you fix it! How to create an incredibly engaging Welcome Video that website visitors will watch to the end! Where to feature your most compelling video testimonials and “how” to title them (hint…. DON’T call them “testimonials!”). The four critical Website Design mistakes to avoid!How to use Facebook and Social Media to drive traffic to your site. Why it’s important to determine the “annual value” (and possibly “lifetime value”) of your clients – and how to easily do this – & how to then exploit this information. How to build loyalty with “reward programs” (both offline and online). How to take a leaf out of the fast-food chains’ customer loyalty programs! How to create a “customer continuity program” in just 24 hours. How you can use “desirable events” as a repetitive trade stimulant for “business to business” relationships (spend a certain amount of dollars with us and you get two tickets to come to the XYZ Industry Convention at the Palazzo Versace Resort on the Gold Coast). In other words, hold an event at a “wow location” as a reward for the businesses buying from you – and disguise it as an industry convention if you need to! Examples of successful “repetitive trade programs” for businesses across lots of industries. Complimentary “JD critique” of your 90 day marketing plan! 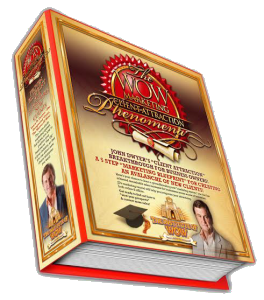 Here’s a crazy, crazy, knockout additional “Wow Factor” to this Phenomena Program! An inclusion in your Wow Workbook is a sample 90 Day Marketing Plan for a business. It’s a plan which JD helped a business put together and includes both online and offline marketing tactics. Also in your Wow Workbook is space for you to complete you own 90 Day Marketing Plan. 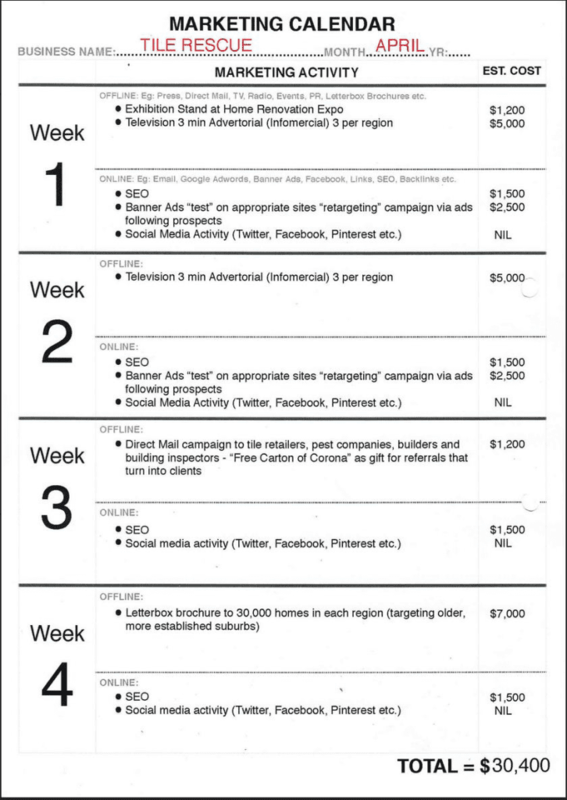 This is a sample of a 30 day component of a “90 day marketing plan” JD put together for a client. You’re invited to complete your very own 90 day marketing plan for your business and email it to The Institute Of Wow – and JD will personally study your plan and provide you with an “audio critique” within 14 days! Yes, we’ve used the term “insane value” once already, but that’s exactly the phrase that best describes this incredible bonus! This would be like Steven Spielberg providing “personal critique” to budding filmmakers! You’re going to get his “undivided attention and personal critique” of your marketing plan AS A FREE BONUS! It doesn’t matter where you are in the world – within 14 days of you providing JD with your marketing plan, he’ll send you a link to his “audio critique” providing you with his opinion and suggestions for improvements. Because he knows the only way you’re going to get the maximum value from this Phenomena Program is by actually “taking action” and putting together a marketing roadmap for your products or services. Hence he’s willing to provide you with the incentive to put a “Wow Factor” marketing plan together by offering this incredibly valuable complimentary bonus! WATCH THIS TO SEE “A SAMPLE” OF JD’S WEEKLY VIDEO TRAINING OF HIS PROPRIETARY WHEEL OF WOW CLIENT ATTRACTION SYSTEM. IMAGINE KNOWING HOW TO COMPLETELY TRANSFORM YOUR MARKETING TACTICS SO YOU CAN TURN ON THE “CUSTOMER TAP” WHENEVER YOU WANT!! “Client – Attraction Phenomena” video training underway!